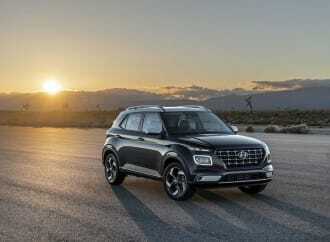 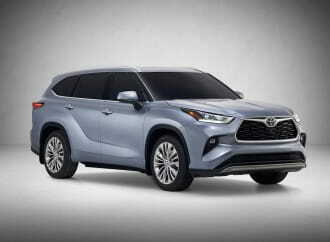 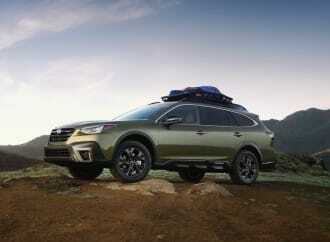 With just a touch of spring starting to grace the city, the minds of enthusiasts everywhere are starting to turn away from crossovers and onto more engaging vehicles for the warmer weather. 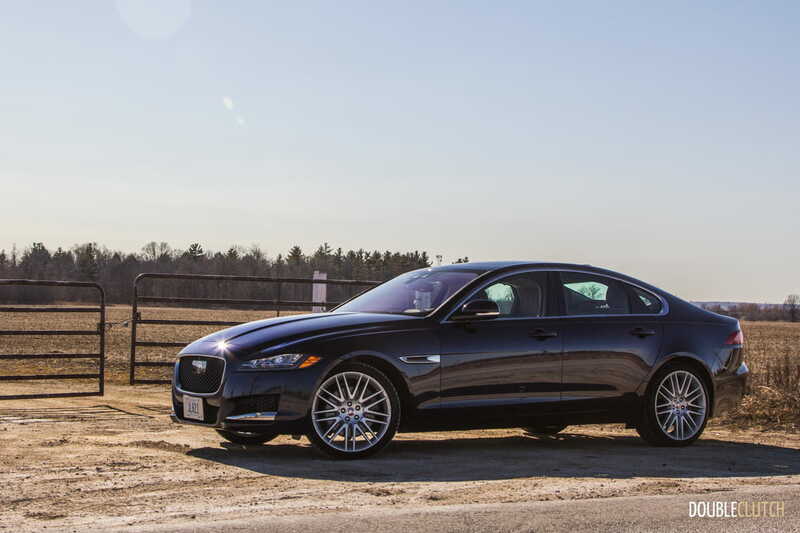 Garage doors are cracking open for the first time in months as some toys venture out for their first ride of the season. 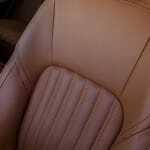 As a bit of a British car enthusiast myself, I too am growing anxious to dust off my MGB for a nice spring drive. 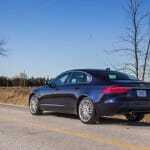 I am also a fan of classic Jaguars, having parted with my Jaguar XKE this past fall. 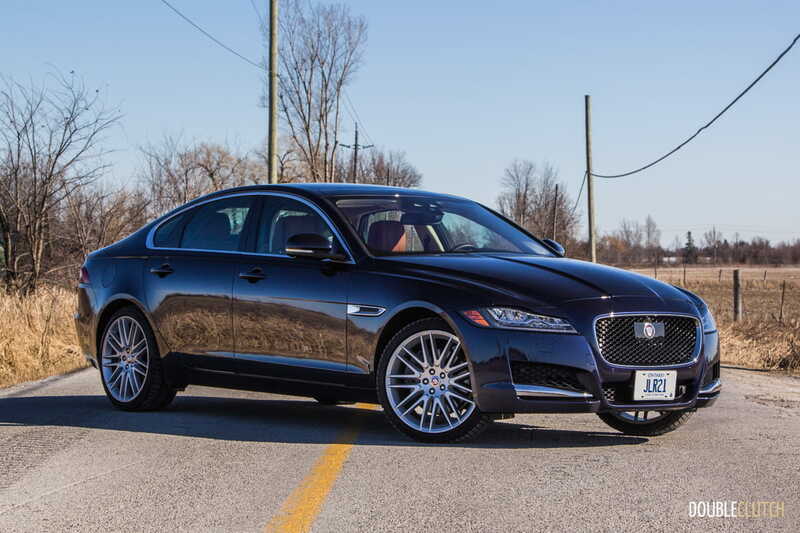 A week with a modern Jag might just help ease the tension, and I was appropriately assigned this 2018 Jaguar XF Portfolio 35t. 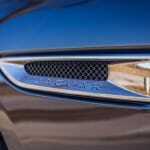 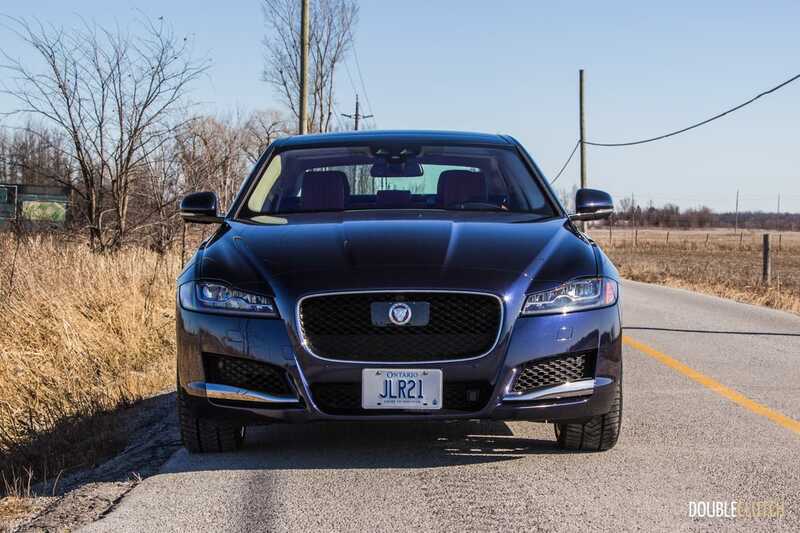 Like most Jaguars, the XF carries great presence from the front with the signature mesh grill prominently adorned with the legendary Jaguar logo. 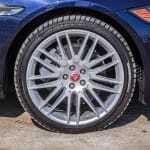 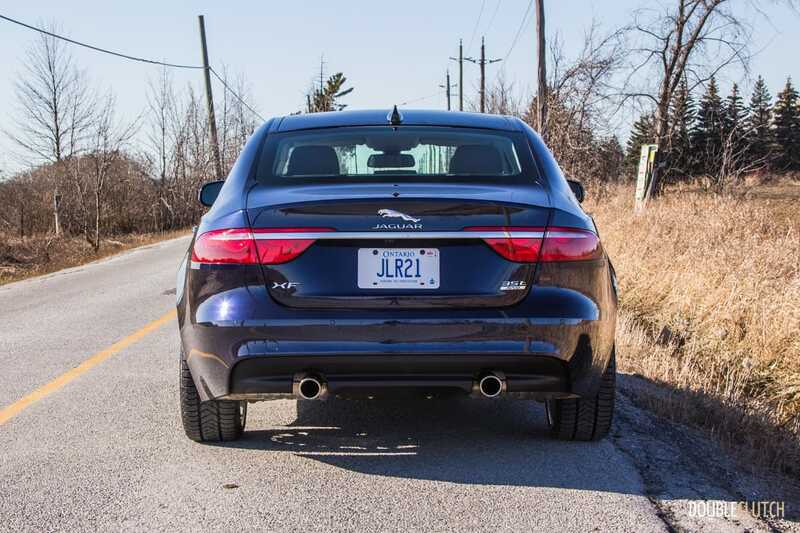 The lines flow well and hint at Jaguar’s sporting heritage, which compliments the aggressive stance and gorgeous optional 19” split-spoke wheels. 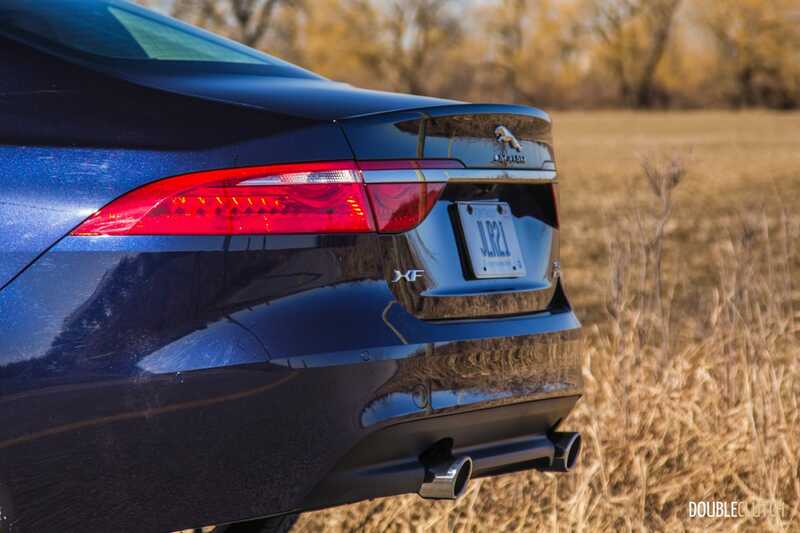 Overall, it’s arguably one of the best-looking cars in the midsize luxury sports sedan segment, except from the rear. 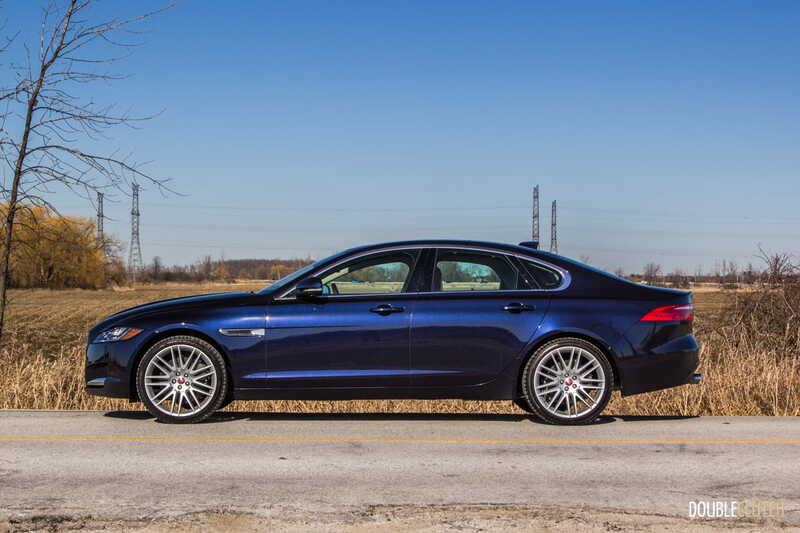 Either way, it’s a decently styled car and the exterior fit and finish is outstanding with high quality paint work, near-perfect panel gaps, and tasteful details everywhere. 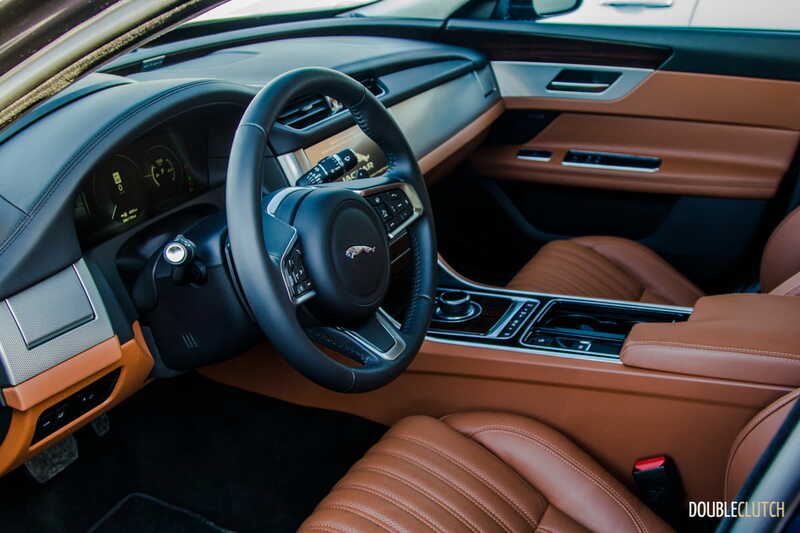 Opening the door reveals a stunning interior and while all XFs come with pretty posh cabins, the top-line Portfolio like our test car takes it to the next level with miles of finely finished and stitched Windsor leather. 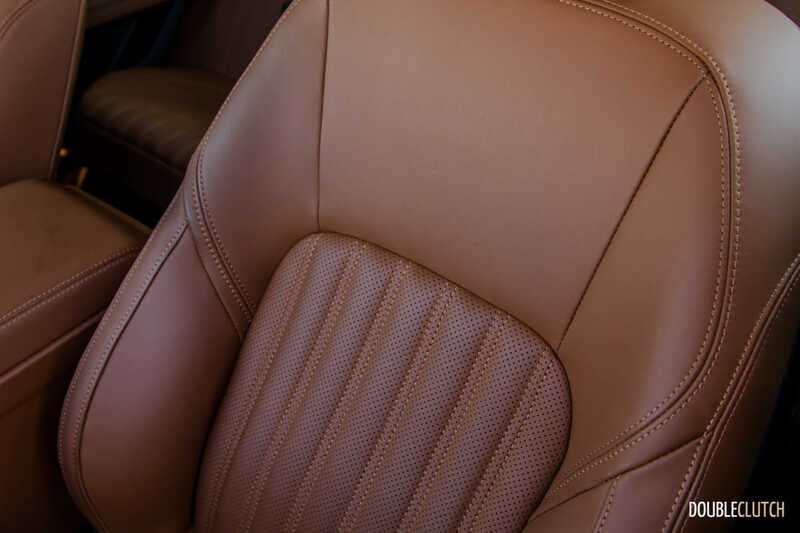 The heated and ventilated seats are finished in the same with a fluted pattern and with 20-way adjustment ability, anyone can find themselves in absolute comfort. The designers at Jag have clearly taken a lot of time to make sure the interior looks fantastic, as you can have your choice of neatly inlayed wood grain accents, and the Portfolio sports a proper suede headliner. 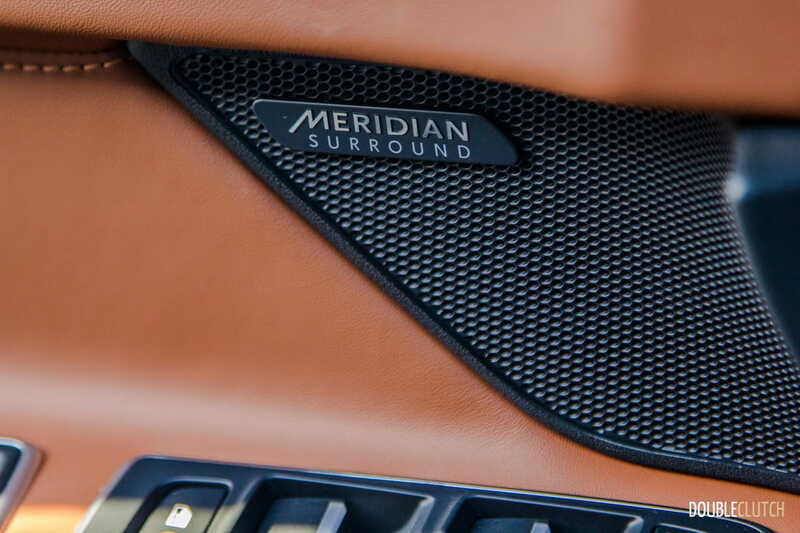 Continuing the focus on aesthetics, the rotary dial gear selector rises up out of the center console, and the dashboard air vents reveal themselves from behind their automatic covers. 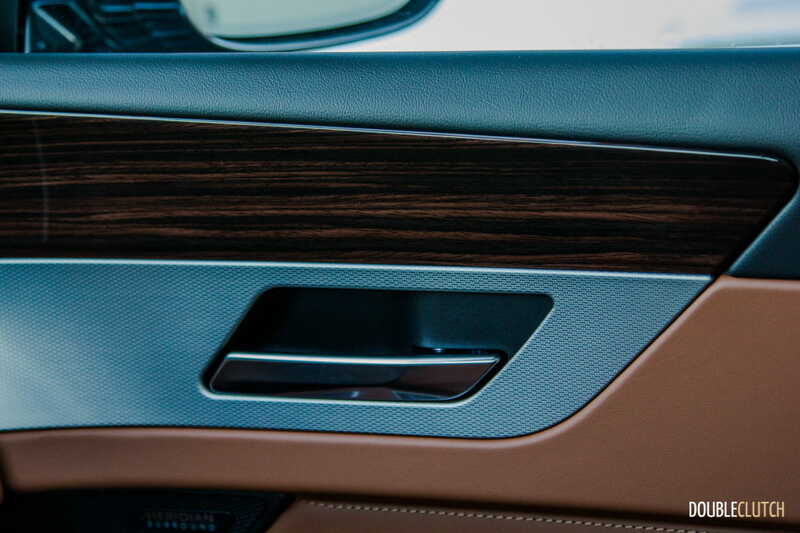 The rear seat offers plenty of head and leg room even for adults, and gets its own digital climate control display. 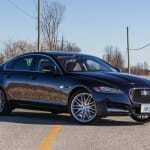 The trunk in this sedan is very deep, meaning it easily handled the weekly grocery run, but it is rather shallow which could pose a problem with bulkier items. 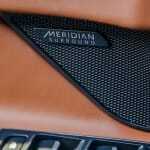 Fortunately, the split rear seats fold to reveal a large pass-through, adding some flexibility. 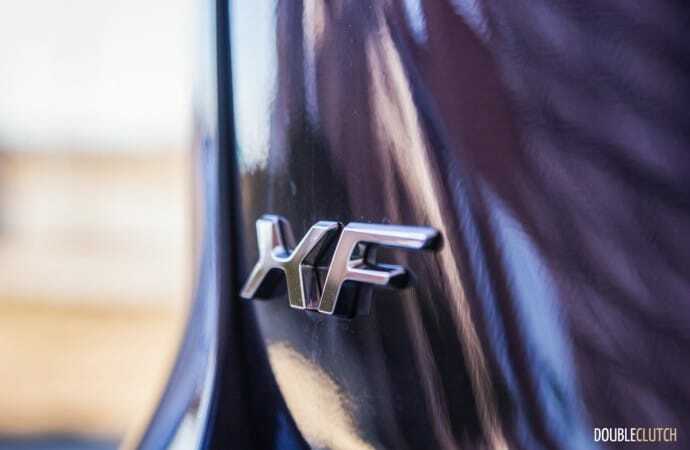 Of course, this loaded XF comes with a long list of luxurious features; heated steering wheel, adaptive cruise control, automatic climate control, a huge glass sunroof, and Jaguar’s fully heated windshield which is a god-send on frosty mornings. 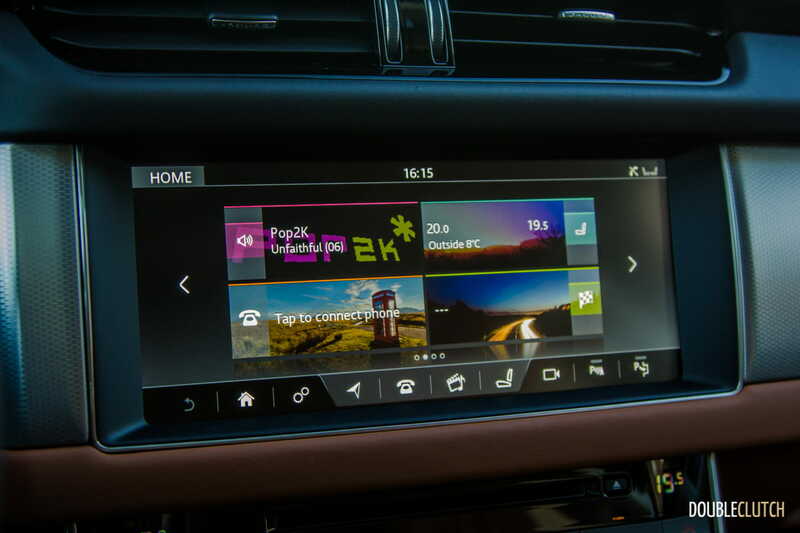 The problem is that using a lot of these features can be a bit tricky since most of the controls in the XF are far from intuitive. 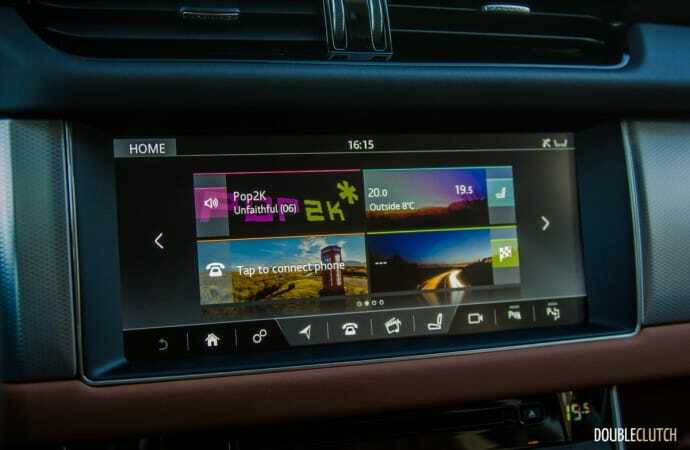 The InControl Touch infotainment system lacks modern integration tech like Android Auto and Apple CarPlay, but more so is extremely cumbersome to use. 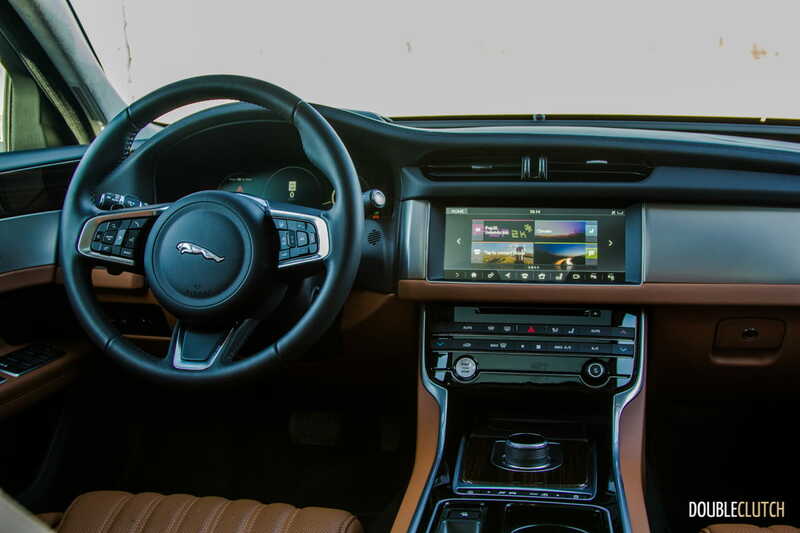 The heated/cooled seat controls are also awkward in that there is a single button on the dash which brings up the touchscreen menu, which you need to interact with in order to turn the power on and set the level of heating or cooling you want. 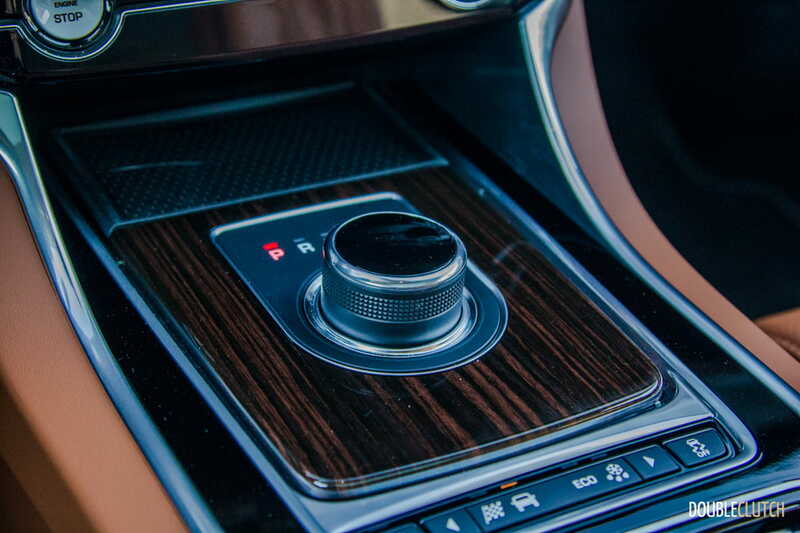 Something used as frequently as heated seats should require no more than one or two pokes at a button. 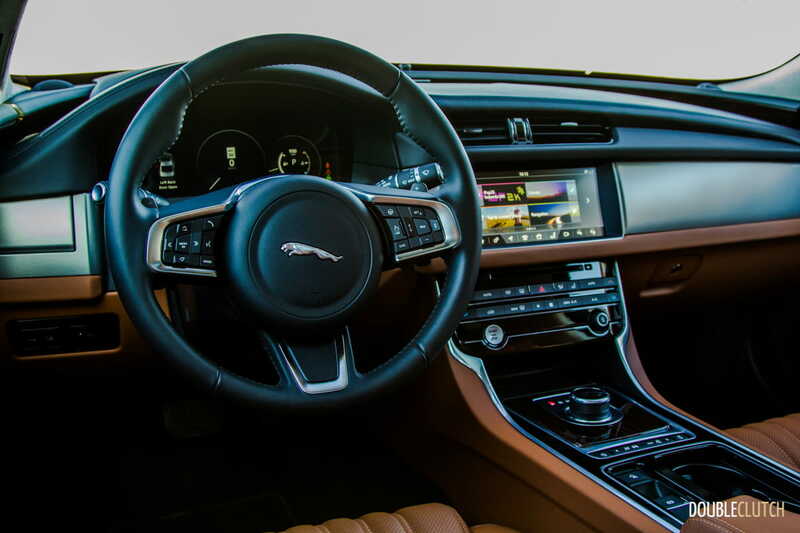 The Jaguar’s ergonomic shortcomings though are quickly forgotten once you’re actually out on the road with it. 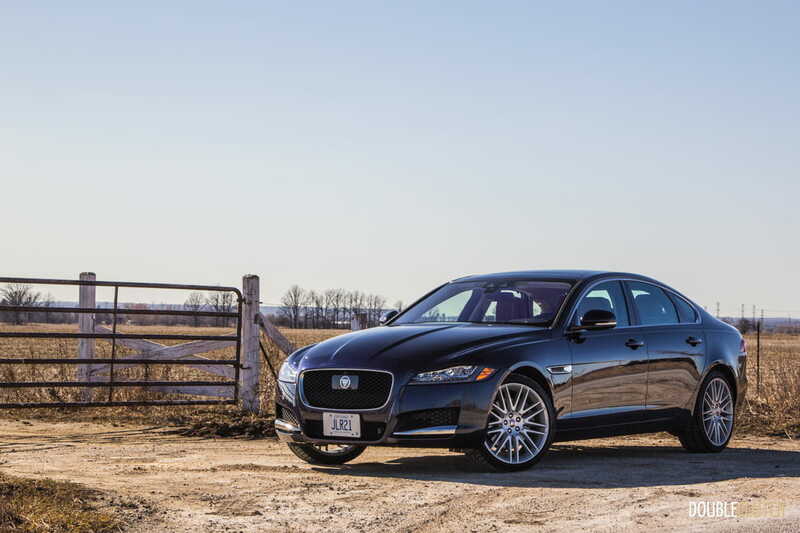 Jags tend to have a very certain poise on the road; a balance between comfort and control that few cars can match, and thankfully the XF feels true to this. 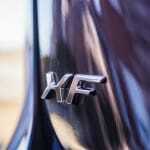 Cruising along the XF is silent and the ride remains comfortable and composed regardless of the conditions. Get into the twisties and the XF surprises with its aggressive steering response and flat cornering abilities that make it easy to forget that you’re behind the wheel of a 4,000-pound sedan. Steering feel is positive with good feedback from the road and the all-wheel-drive system does a great job of keeping the XF going where you want it to. 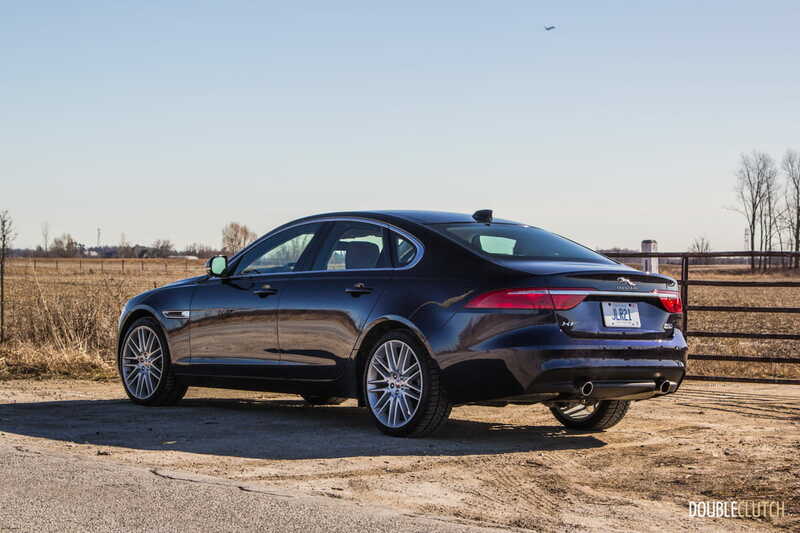 The powertrain options for the XF are where things get a bit tricky. 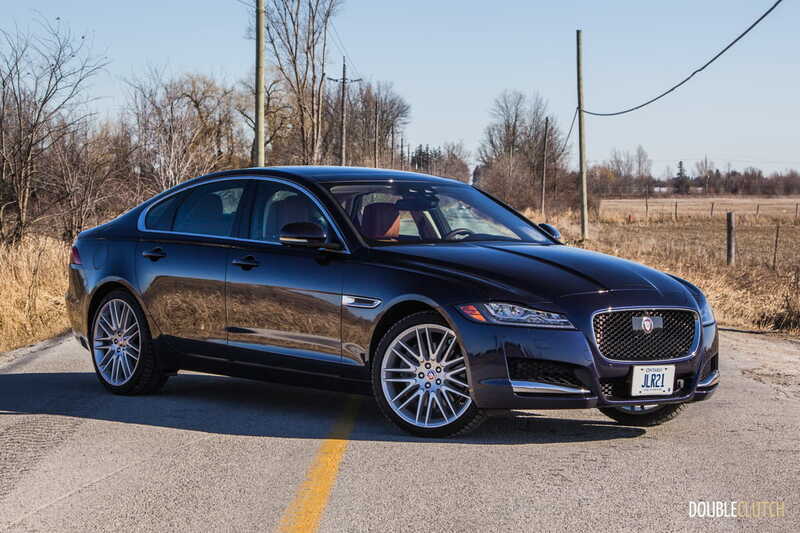 For 2018, Jaguar lists a base price of $58,900 and at that price you’ll get the entry level 2.0L turbocharged four cylinder gas engine with a respectable 247 horsepower. 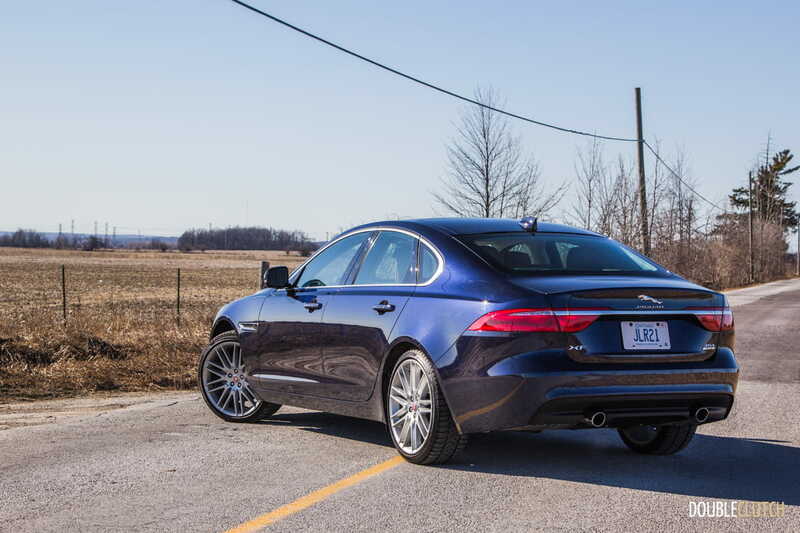 For $2,000 more you can get into the 2.0L diesel (reviewed here) which only puts out 180 horsepower but makes up for it with 318 lb-ft. of torque. 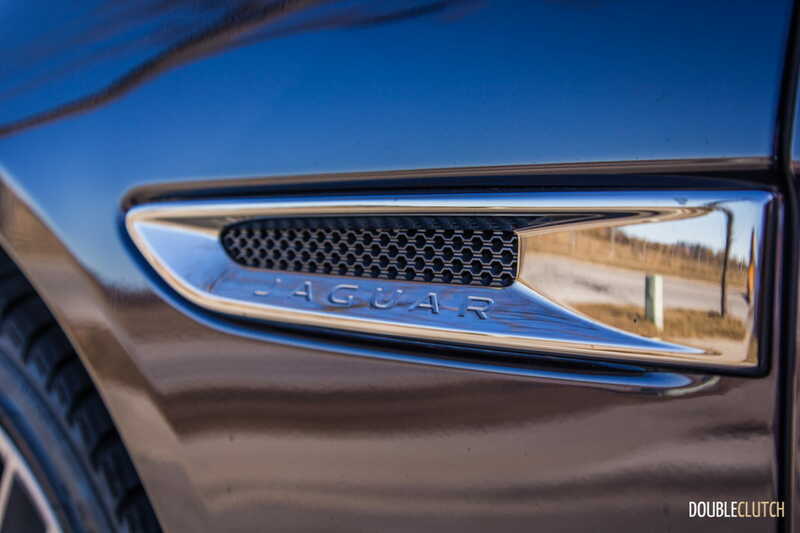 Step up another $500 and you can have a hotter version of the 2.0L gas burner (badged 30t), now putting out 296 horsepower. 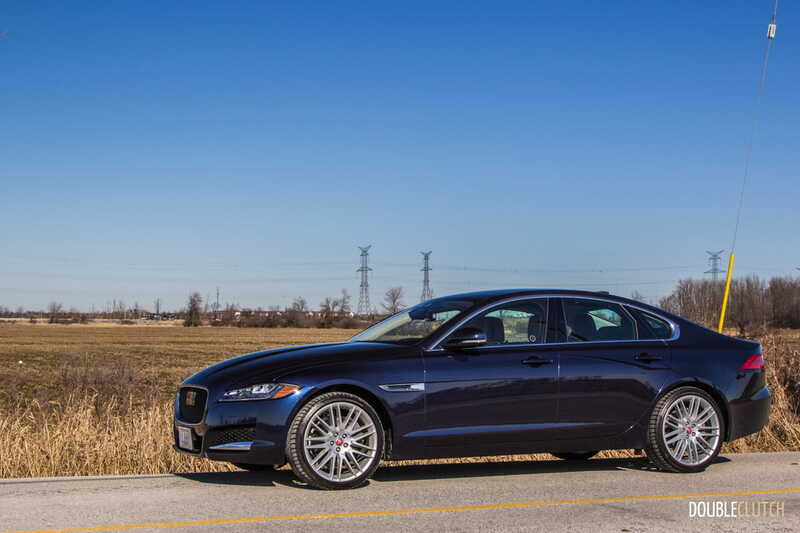 If that’s not enough, you can get yourself into an XF S (reviewed here), starting at $74,500, which among a long list of optional performance oriented equipment comes with a heart-pulsing 380 horsepower supercharged 3.0 V6. 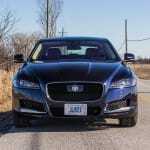 All of these engines come attached to an eight-speed ZF automatic with paddle shifters that has no problem keeping up the pace and compliments the XF’s composed handling qualities. 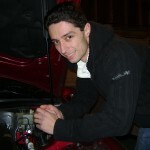 So what engine does our tester have? 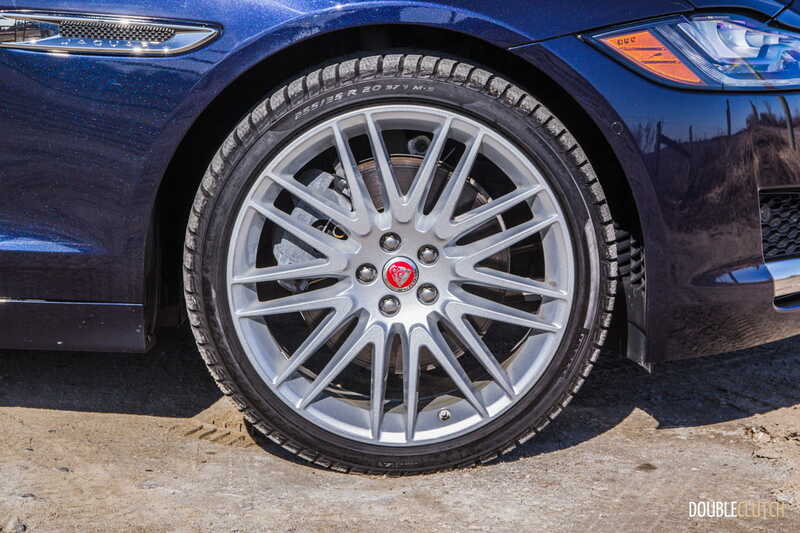 None of these, actually. 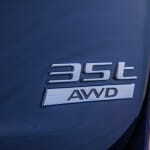 Despite being as a 2018, the test car is equipped with the 340 horsepower version of the 3.0L supercharged V6, known as the “35t” that appears to have been removed from the menu midway through 2018 in favor of the four cylinder options. 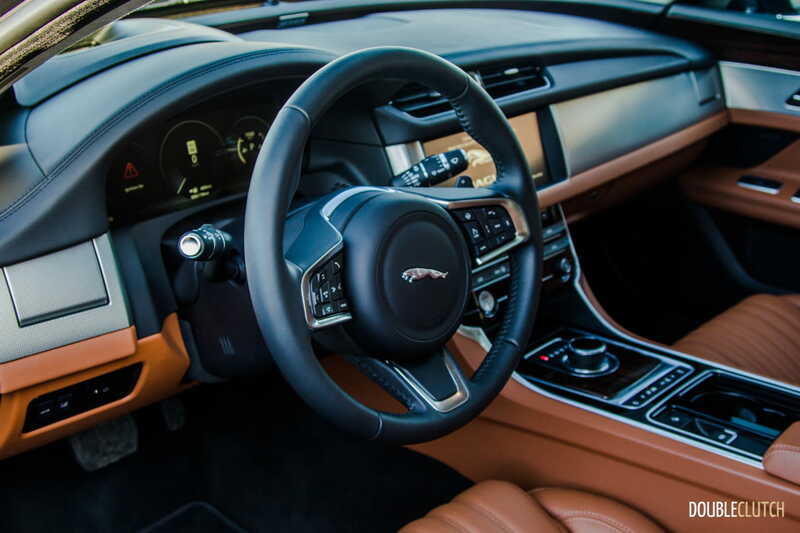 It’s a peach of an engine with a sweet growl on start-up and heavy acceleration, an extremely linear power curve and 332 lb-ft. of torque at 3,500RPM, more than enough to toss you firmly back into your seat. 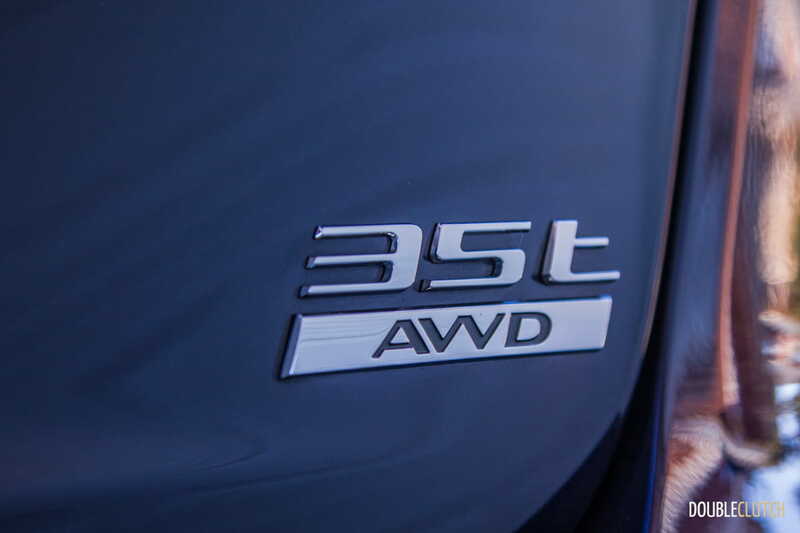 The engine’s character suits the car so well it’s a shame that it’s no longer available, leaving only the even zestier “S”. The supercharged V6 really brings the car to life, and while I am sure that the four cylinder motivators are adequate, I’d still likely be putting my money on the V6. 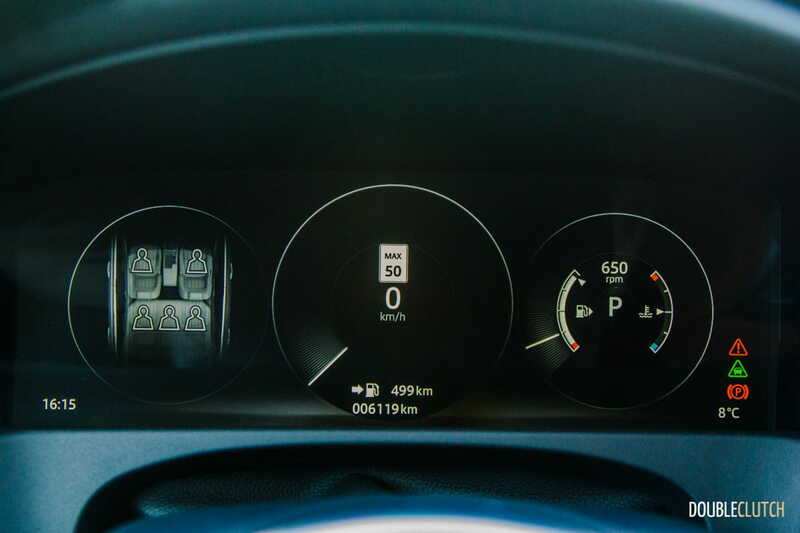 Even then, the V6’s fuel economy is very palatable, with the weekly average after mostly rush hour commuting coming to 11.3L/100km on premium fuel. 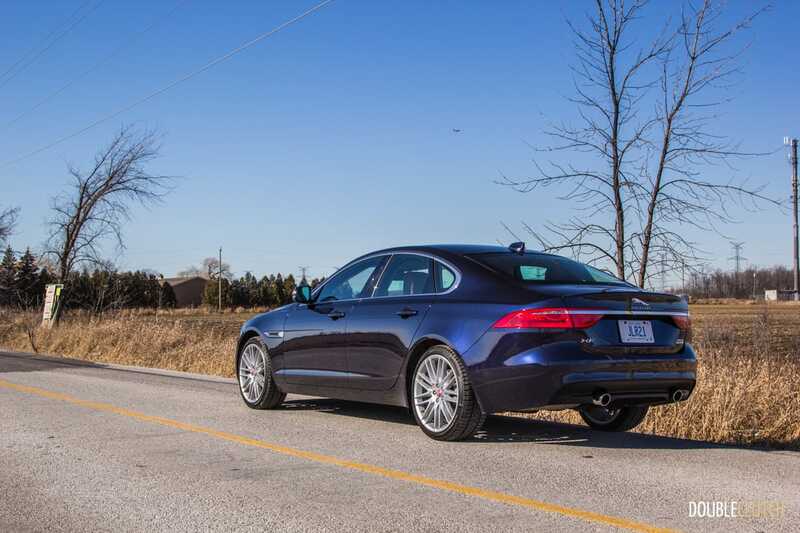 While you can get a nicely equipped four-cylinder powered XF for somewhere in the mid $60,000 range, a very fair value in this segment, the top-line Portfolio like our test car starts at $79,900 and comes out to $85,290 after you add the $3,680 Driver Assistance Package, $410 for the heated windshield and $1,530 for the beautiful wheels. 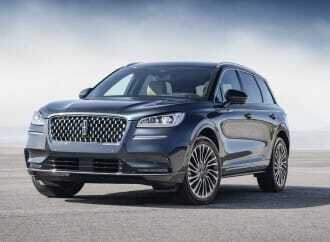 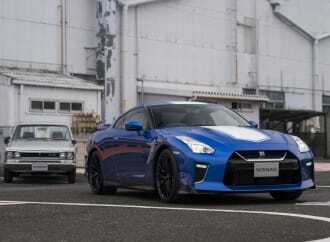 At that price you’d be getting the 296 horsepower 2.0L. 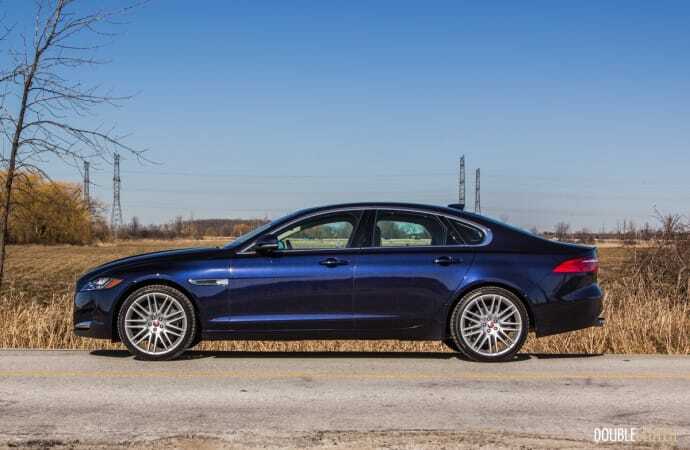 Personally, I’d forego some of the luxuries linked to the Portfolio package and give the “S” and its powerhouse 380-horsepower V6 some serious consideration. 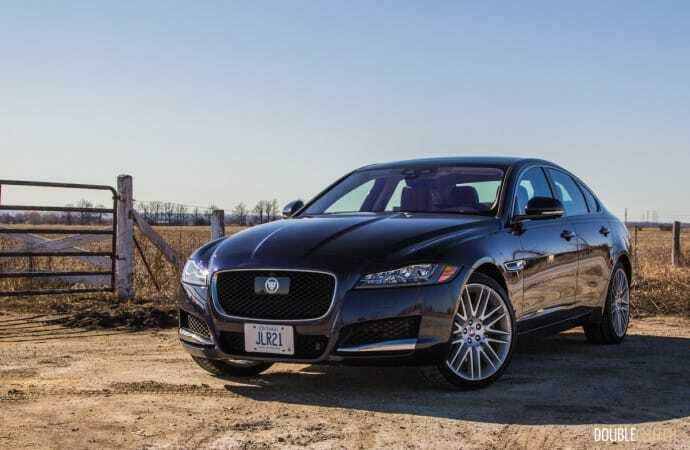 Engine options aside, the XF’s chassis is downright impressive, and the substantial use of aluminum throughout allows it to remain light on its feet while retaining that signature Jaguar comfort and poise. 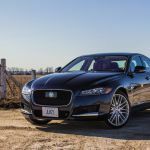 It is no doubt a car worthy of the Jaguar nameplate, and if you’re not a stickler for ergonomics, the XF is definitely worth serious consideration in this segment.